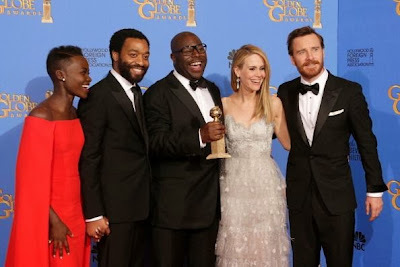 At the last damn minute, nearly three hours into the program, after losing six categories, the Golden Globes gave 12 Years a Slave one award, the Best Picture in the 11th hour. I'm happy and proud for the director and cast of the film, but I can't help but feel that they were humiliated to sit there for hours and not have one person win in the other categories. This is my final year watching the Golden Globes and giving a damn about it. 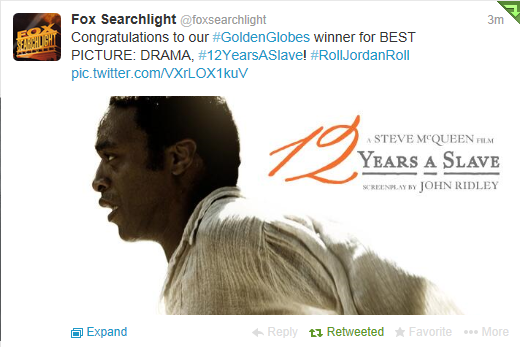 So for what it's worth, congratulations to Fox Searchlight for this win... now on to the REAL awards. Thanks to those of you who participated in the FF chat tonight, it was a lot of fun! The one award won out of seven nominated categories. I was so happy for this late win. Yes Simone, the chat was fun. Get up early to see what happened, so the first thing I did was going to the blog.Reading this post I can't help thinking that I was glad not to stay awake. I feel joy that they win the best picture, but I can't subscribe my feelings about losing (some) other categories. The best film category is a very important one, but it makes you wonder about the qualities the actors must have to recieve an award for their skills. For all the fassinators who did watch the show and chat...sweet dreams! I am certain that awards are about what people (in most cases journalists and film people and not the audience) like and know (e.g. actors). Even TYAS has not premiered in Germany yet I am certain that the topic of this film is not something to like or a film that you like watching again. So they go with the easy choices and to do a Kassandra warning: Don't get your hopes to hight for the Academy Awards. I'm glad a lot of people didn't waste their time. As I mentioned, I dropped the stream feed when there was still an hour and 10 minutes left, I just got bored and frustrated with it all. Woke up this morning to the news and I'm not at all surprised. I stopped watching award shows and beauty pageants about 15 years ago. I figured TYAS would receive The Color Purple treatment. I also think TYAS only won the best drama category because American Hustle was put into the 'comedy' category. How do you win best picture without winning any other awards - think about it. While American Hustle was good it really didn't hold a candle to the superb TYAS. Also, not expecting anything from the Oscars. I hear ya Deseree... 12YAS did get The Color Purple treatment. I hear mixed things about American Hustle, and I'm not the least bit interested in seeing it. Last night was a sham and that's why I can't be bothered with the GGs anymore.